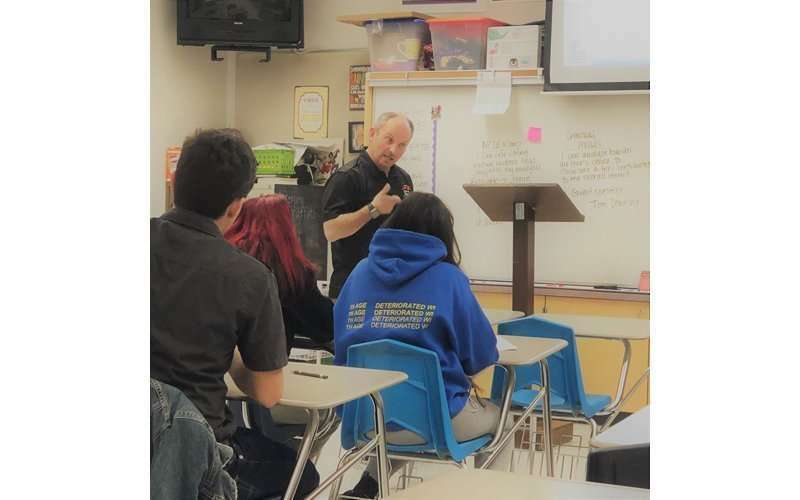 Lassen High School English teacher Shelley Bennett wasn’t sure if her idea of having a criminal minds English class would be approved when she pitched it to the administration — but it was, and now students have the opportunity to read, write and delve into the psychological tendencies of what makes criminals tick. Once approved, Bennett, a true crime fan herself, had to come up with various plans for the reading and writing heavy course. “I’ve always been interested in it,” said Bennett, noting she read her first true crime book, “The Stranger Beside Me,” in high school. In the class, students read true crime novels, they have done projects on various criminals and have even practiced suspense writing. “It’s a weird class, it’s not for everyone,” said LHS senior Elora Stalter. However, her fascination with true crime is one of the aspects fueling her interest in a career of detective work. Stalter noted students have to have an open mind set in the criminal minds class, as they question what drove the people to commit crimes, but said it’s “by far” one of her favorite classes. In the class, students started off the year reading Truman Capote’s “In Cold Blood,” a non-fiction novel detailing the murder of a family in a small Kansas town in 1959. According to Bennett, students also read the book “Helter Skelter,” which details the Charles Manson murders and includes the prosecutor’s perspective. One of the assignments students took part in had them listen to Beatles songs and other 1960s music to see if they could determine what Manson heard from the lyrics that drove him to the gruesome outcome. When senior Genesy Davis was looking at what classes she wanted to fill her schedule with, she was mainly looking at credits, but also realized she was interested in learning about the matter. She said she grew up learning about serial killers and cults, as her mom was interested in true crime and the reasons people committed the atrocities. Being in the class has made her ponder what it would be like as a career. If there are any students interested in learning about the matter and interested in the psychology behind crimes, she urges they take the class. “It’s just a really interesting class,” Davis said. Often, Bennett noted, the students want to delve deeper into the psychology of the crimes, which has her doing additional research to better inform her students. Helping with additional information, there are also guest speakers invited. 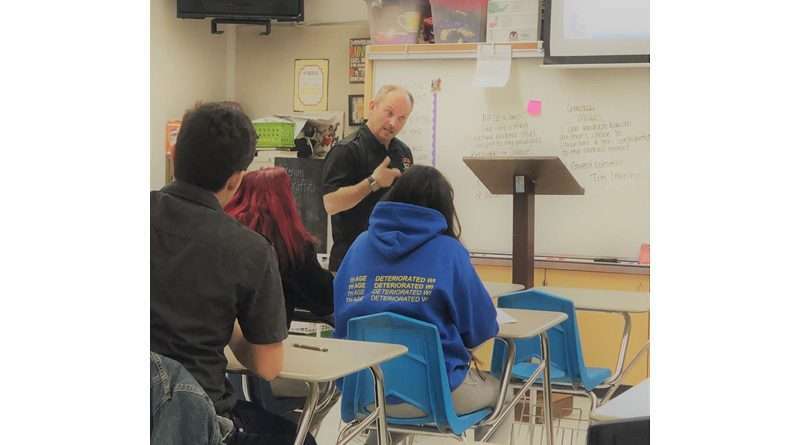 Lassen Community College Administration of Justice instructor Tom Downing gave a presentation on eyewitness scenarios, and Susanville Police Chief Kevin Jones will come and talk about having empathy for victims and their families. “We always have to remember there’s somebody who lost someone,” said Bennett. The English teacher also noted the students are responding well to the class. When it first started in the fall semester, there were those who thought the class would be like watching an episode of “Criminal Minds,” everyday, and did not realize how much reading and writing were involved. The interest remains, though: There are already 60 people signed up for the class next year. Bennett also noted there has not been any outcry related to the class. Parents gave consent for the reading material, she said, and generally are interested in true crime as well. However, she constantly works on being respectful to everyone regarding the sensitive material. There are plans to continue with this class, which counts as an English class to state universities, and Bennett said she would take the summer to reflect on how the first year went. Overall, while the topic of true crimes may put off some, the excitement from current students and the long list of students signing up for the class shows there’s an interest in the sometimes sensitive material, and the local class is working to expand students’ skills regarding true crime writing and even the psychological side behind the deeds.